Matt Howard was recently named as the first director of the Alliance for Water Stewardship-North America (AWS-NA). Mr. Howard will lead implementation of AWS's voluntary global water standard at North American facilities and roll-out the AWS verification, training and membership programs. As part of The Water Council, Mr. Howard and AWS-NA will also develop other water-related sustainability and stewardship programs for U.S. companies and other water users. Prior to joining AWS-NA, Mr. Howard served as Milwaukee Mayor Tom Barrett's Sustainability Director from 2010 to 2015. 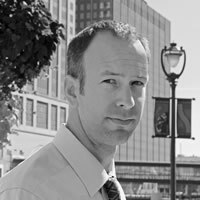 In that capacity, he published North America's first municipal urban water system benchmarking report and led the development of Milwaukee's water-centric sustainability plan – ReFresh Milwaukee. Mr. Howard managed nationally recognized green infrastructure initiatives as well as programs that improved the sustainability of over 1,300 Milwaukee homes and over 200 businesses and manufacturers. His programs stimulated nearly $30 million in economic activity and saved tax-payers over $1 million annually while reducing emissions and pollution. Mr. Howard also spent 11 years with the U.S. Department of Commerce in Washington, DC working on a variety of national economic issues including his creation of a national Sustainable Manufacturing Initiative. During this time, he advised Commerce's Chief Economist on the Department's first green jobs report, worked with the White House Council on Environmental Quality on implementing the Administration's Green Government directive and advised the U.S. House of Representatives, Committee on Ways and Means on trade and economic development issues. Mr. Howard was recently appointed by the EPA Administrator to the National Advisory Council on Environmental Policy and Technology. He has a B.A. and M.A. in international economics and is a LEED and Lean Six Sigma accredited professional.